NOAA recently issued a warning that ocean warming may push common fish staples into more northern climes, causing a shift for fisherman and an introduction of “invasive” species. There are also several species of fish that have invaded lakes and rivers that gobble up juvenile local breeds. It’s proven very hard to eliminate only one kind of fish from an environment. One solution may be “If you can’t beat ’em, eat ’em”? 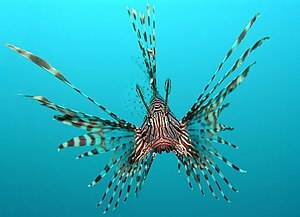 An invasive species, the lionfish is devastating reef fish populations along the Florida coast and into the Caribbean. Now, an increasing number of environmentalists, consumer groups and scientists are seriously testing a novel solution to control it and other aquatic invasive species — one that would also takes pressure off depleted ocean fish stocks: they want Americans to step up to their plates and start eating invasive critters in large numbers. “We think there could be a real market,” said Wenonah Hauter, the executive director of Food and Water Watch, whose 2011 Smart Seafood Guide recommends for the first time that diners seek out invasive species as a “safer, more sustainable” alternative to their more dwindling relatives, to encourage fisherman and markets to provide them. more via Can’t Eliminate an Invasive Species? Try Eating It. – NYTimes.com. Unfortunately I’ve heard the lionfish doesn’t taste very good, but if they get the right marketing campaign on this, lionfish sushi may become all the rage! As the Caribbean reels from an onslaught of invasive Lionfish, we took a great idea from Scotty Grey owner of the M/V Kate and Blue Iguana Charters based in Florida and had some fun with it.